Peter has continued to use his ingenuity and determination to develop yet another highly impressive, original product, now available as web versions both with and without the code to help you keep the taxi on the road. Program Knowledge provides you with a destination chosen at random from more than 30 streets and 32 places of interest in the West End of London. An arrow in the top left of the screen indicates the direction to your destination as the crow flies. If the destination is a street, the arrow points you to the nearest junction on that street. Use the mouse to guide your taxi (represented by a small blue circle) to the destination. The arrow updates continuously to help you. (Of course, if you do not want to go to the chosen destination you can ignore it and just explore the West End!) If the taxi is heading off the road the code will detect the colour change and nudge it back on. The width of the window is 500 pixels and each map square is 300 x 300 pixels. At each update of the screen the required bitmaps are loaded. (The bitmap file type is especially well-named for its use here!) The taxi is always drawn in the centre of the window. 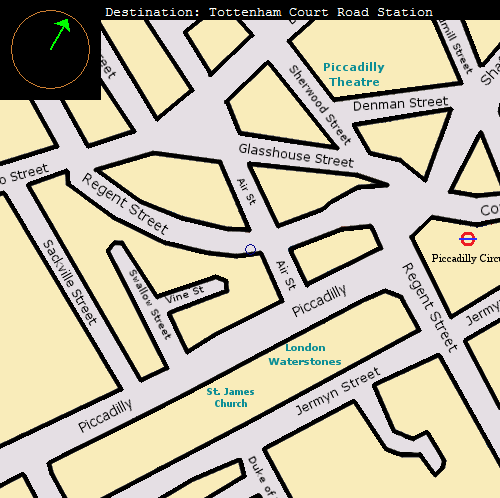 The first screenshot shows the taxi on its way to Tottenham Court Road Station. 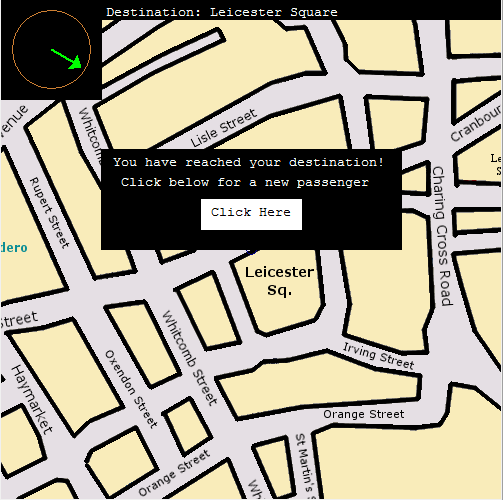 The second screenshot shows the taxi arriving at another destination - Leicester Square. As soon as you click in the required area you are provided with another destination more than a certain minimum distance away. The following extract is from a summary of some research by the Wellcome Department of Imaging Neuroscience. “Dr Eleanor Maguire scanned the brains of 16 London black-cab drivers, who had spent an average of two years learning 'the Knowledge' – street names and routes in London. The taxi drivers had a larger right hippocampus than control subjects, and the longer they had been on the job, the larger their hippocampus was”. This program is not guaranteed to increase the size of your right hippocampus but is likely to improve your knowledge of the West End. We urge you to download and extract the required zip files and try it. Over 70 map squares produced painstakingly by Peter are compressed in maps.zip which you can download here. Put the unzipped maps folder in the program folder. You will need to have downloaded also Stefan Berinde`s wingraph.zip file as described in our Graphics tutorial. You should copy the unzipped wincrt.pas, wingraph.pas and winmouse.pas (from the src folder) into your program folder. If this program gives a SIGSEGV error message when you attempt to compile and run it using Lazarus, it might have produced the required executable file. If so, open the program folder and double click on Knowledge.exe to execute the program. Peter uses parallel arrays to store the street names and the corresponding X and Y coordinates of the junctions, so the name of the street occurs once for each of these junctions. The random choice of index for a street destination will favour quite reasonably the streets with most junctions. if (getpixel(250, 247) = 12250361) or (getpixel(250, 247) = 12447743) then  //I have two colour codes here for variation from different computers. If the car can go out of the road then your computer must use a different code for the background colour. Could you develop this program, for example by allowing the user to select a destination? Could you use Peter's map squares in a program of your own?